On February 11, 2012, I issued a revised 12-month price target for Apple of $790 per share. Since that date the share price has risen about 10% to Friday's closing price of $545.18. Over the next twelve months I expect the share price to rise at least 45% from Friday's closing price to reach above my published target. In FY2012, I forecast Apple's earnings per share to rise at least 100% from FY2011's $27.68 to over $56. Apple began this fiscal year with an eps gain of over 115% to $13.87 in the December quarter. The March and June quarters will deliver eps growth rates at or near 100% due to strong unit sales of the iPhone 4S and strong unit sales of the new iPad models that will be released later this month. This fiscal year will end with an extraordinary high eps growth rate in the September quarter due to the company's languid performance in the prior-year period. The release of the iPhone 4S in the December quarter creates a soft prior-year comparison in the quarter that closes the current fiscal year. Even at a modest multiple of 12.5 times trailing 12-month earnings, at $56 in FY2012 earnings per share, Apple's share price will reach $700 by early November. While it's not practical to forecast the earnings multiple the market will award Apple, it's also not necessary for the multiple to expand to reach my stated 12-month price target. At Friday's closing price the shares are currently trading at 15.52 times trailing 12-month earnings. Even if the multiple contracts, the share price advance will remain on track. Earnings growth will deliver strong share price appreciation for Apple whether or not the earnings multiple expands or contracts. Posts At Eventide Axiom #2: Applying The "Law of Large Numbers" to Apple is Bunk! In the December quarter, nearly 75% of Apple's reported revenue was sourced from products that did not exist in the market as recently as five years ago today. With the forthcoming refresh of the Apple iPad product line, the percentage of reported revenue generated by the iPhone and iPad will continue to rise well into next fiscal year. At this time, the market for the Apple iPad can not be accurately determined nor defined and the product line remains in a nascent phase of global market development. 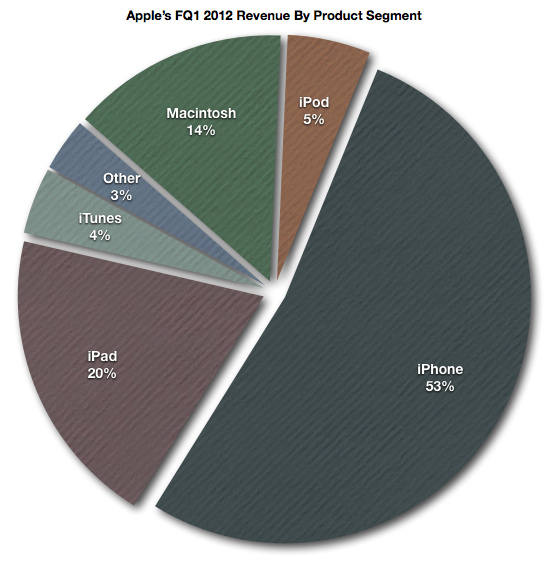 The chart below illustrates the sources of Apple's $46.33 billion in revenue in FQ1 2012. Apple is growing geographically and by the middle of FY2013, more than two-thirds of the company's revenue will be sourced from product sales outside the United States. Revenue growth in China will again top 100% this fiscal year and a number of large countries remain to be fully explored for sales growth opportunities. These countries include Brazil, Russia and India. While infrastructure limitations will factor into the pace of the company's global expansion, at this time Apple is currently addressing only a fraction of the global market for the company's products. If there's a rule to apply, it's a "law of smaller numbers" that works in favor of a higher share price. Each additional $100 advance in the share price is less of a percentage rise than the $100 share price advance that preceded it. The recent December quarter iPhone units sales growth of 128% to more than 37 million units indicates when iPhone availability on all major carriers in a region is not an issue, the product line performs extraordinarily well against all competing handsets from any and all other smartphone manufacturers. Android is not a company. It's an amalgamation of handsets offered by an array of manufacturers and the products have a wide range of prices, features and capabilities. Only a fraction of the Android handsets available compete in any way with the iPhone. Most Android handsets are sold in price tiers in which Apple does not compete and these handsets are no match for the iPhone on features or function. Microsoft's reentry into the smartphone market through the tie-up with Nokia will provide more competition for Android handset makers than the competition these handset makers create for Apple. Component supplies, manufacturing capacity and the pace at which Apple can enter currently underserved markets will govern Apple's rates of growth far more than the influence of products offered by competing device makers. The two charts below illustrate the importance of product innovation to the company's financial performance. The annual refresh of the Apple iPhone last year occurred in the December quarter (FQ1 2012) instead of the September quarter (FQ4 2011). A September quarter refresh of the Apple iPhone had been the establish norm. Not only do refreshed products deliver strong revenue gains, a lack of refreshed products will dramatically change the percentage of revenue that flows to the net income line and the percentage of each revenue dollar consumed by operating expenses. Apple must innovate and regularly refresh the company's product lines to sustain strong rates of revenue and earnings growth. As the September quarter results indicate, delays in product innovation represent Apple's biggest financial risk at this point in time. The charts below illustrate Apple's frenetic rates of revenue and earnings growth over the most recent six fiscal years. Absent delays in the company's CY 2012 product refresh cycles, Apple will deliver revenue of over $180 billion this fiscal year and earnings per share above $56. Geographic expansion and the addition of new iPhone carriers such as Sprint and China Telecom continue to increase the company's immediately addressable market for products. Apple's organic rates of revenue and earnings growth will provide sufficient fuel to move the shares to my published price target. A strong argument can be made for a regular quarterly dividend. It would open the proverbial floodgates for investment in Apple by conservative funds and institutions that restrict investments to equities that pay a regular dividend. But a return to a regular quarterly dividend is not needed to reach a price of $790 per share by the end of February next year. Management has again asked for patience on decisions as to the manner in which the company will strategically deploy or distribute Apple's massive holdings of cash and marketable securities that now exceed $100 billion or $100 per share. Apple is currently generating cash at the rate of about $1 billion per week. A dividend would not require use of the company's current cash holdings and could be amply funded from ongoing operations. A share buyback program or a return to a regular quarterly dividend program would only accelerate the pace of share price appreciation over the next year. These are extraordinary events that have no impact on the company's rates of revenue and earnings growth from geographic expansion and the delivery of new and innovative products. Similarly, a share split would have no impact on the rates of revenue and earnings growth. Apple's market capitalization recently surpassed one-half trillion dollars. It's an impressive sum. But the market is not a zero-sum game. A growing global economy and rising equity prices increase the market's capacity to sustain Apple's market cap appreciation. Between now and the end of Apple's current fiscal year, the company will add at least $20 to trailing 12-month earnings. Even if the market discounts that growth in earnings and awards Apple a price-earnings multiple no greater than 12.5 times trailing 12-months earnings of $56 per share, the share price will reach $700 by early November with a strong holiday quarter outcome ahead. Meanwhile, each day the company continues to add to the cash and marketable securities standing behind each outstanding share. Focus on Apple's earnings growth and not on the earnings multiple. Revenue and earnings growth alone will deliver the share price to my published $790 target.